The target is hypocrellin A, which couldn’t look much less like last month’s callipeltoside A. Even a casual glance reveals one intriguing feature of this target - the fact it exists in equilibrium with an isomer. In this case, the type of isomerism at play is atropisomerism, where stereoisomers result from restricted rotation about a single bond. This is down to the non-planar nature of that polycyclic aromatic core - much like the well-known BINAP ligands. This feature complicates both the NMR spectra of the target (mixtures of compounds always present a headache), and the synthesis. However, the group had a cunning strategy in place. 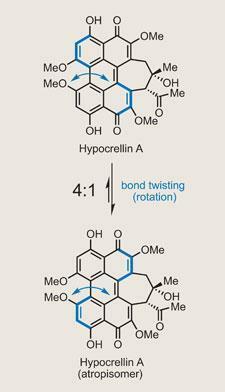 In fact, so confident were they about controlling the helical chirality, they planned to use it to direct installation of the two more traditional stereocentres in a dynamic stereochemistry transfer reaction. On seeing this, my thoughts were, ’a what?’ But clearly Kozlowski anticipated my confusion, and provides an explanation. The idea is to use a precursor, in which helical isomerisation is suppressed at room temperature, to control the stereochemistry of the key intramolecular aldol reaction. This twist in the molecule should direct formation of the two stereocentres as the final seven-membered ring is installed. However, rather counterintuitively, introducing that last ring drops the thermodynamic barrier to atropisomerism to room-temperature or below. This starts the molecule flipping between the two stereoisomers - hence dynamic stereochemistry transfer. First challenge was to install the helical chirality - a Kozlowski group speciality. 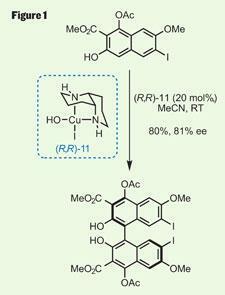 They’ve developed a relatively simple and effective method for this, using a chiral copper catalyst to provide stereocontrol (figure 1).2 This dimerisation of an easily accessible naphthol (produced in five steps from commercial starting material) provided the core of the natural product quickly and efficiently, and importantly in a good enantiomeric excess. This was boosted further to more than 99 per cent ee by trituration to simply wash away soluble impurities - nice to see an old-school technique in such a modern synthesis. After a few functional group conversions, and removal of two ketal protecting groups, it was time to test that high-concept aldol reaction. Treating the 1,8-diketone with a bulky lithium base gave the desired seven-membered ring in good yield and diastereomeric ratio, with only a little leeching of enantiomeric excess, bringing the ’Big Concept’ to practice (figure 2). The final reaction to complete the target was also quietly impressive - three different aryl methyl ether environments existed in the aldol product, but only two are present in the target. This means attempting a chemoselective demethylation as the last step - quite a risky strategy. However, a little magnesium iodide was quite effective, giving the target in a reasonable yield and completing an intriguing synthesis.